In 1949 my dad put a dough-ball on a hook tied to about twenty feet of fishing line, attached the line to the big toe of my left foot, sat me on a dock and threw everything but me into the Panama Canal. That was when I first began fishing and I've been at it ever since. Like many people, I progressed through worms, grasshoppers and lures to fly-fishing. 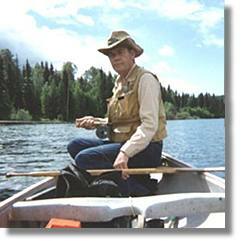 In 1974, I became interested in the scientific aspects of fly-fishing (Piscatology). Since 1976, I have been keeping detailed records of fly-fishing as it relates to the weather, the water, the fish, the feed, the fly, the moon, the catch and an assortment of other information. This computerized database along with research, observation and knowledgeable friends has gone a long way to help me understand the art and science of fly-fishing. I like to share my information base. I have conducted fly tying and casting lessons, Lake Limnology and Aquatic Entomology lessons and written numerous articles or shorts for magazines, newspapers, bulletins, the inter-net, and a book. At one time I published my own fly-fishing almanac and I also like to produce maps of lakes. I have held every executive position in the Kamloops Fly Fishers Association at least once and was also the KFF bulletin editor for a number of years. I even served my time on the executive of the BC Federation of Fly Fishers. Probably one of my most enjoyable experiences was being ghillie for the New Zealand fly-fishing team during the World Fly-Fishing Championships. I still have to go to work each day so don't really have time to respond to e-mail inquiries. Remember that you don't have to catch a fish to enjoy the fishing. If you do catch a fish, that's just a bonus.